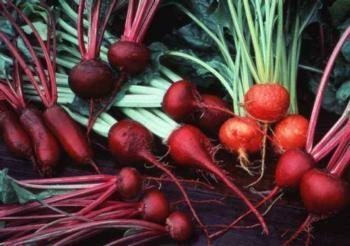 When to plant: Beets can be grown year round in Santa Clara County, but grow especially well in our cool season. See our Vegetable Planting Chart for best timing. Beet 'seeds' are actually a lumpy cluster of seeds. Because several plants can germinate from one seed, it's important to thin the excess seedlings to allow a single plant to form a large root. When thinning, cut the plants rather than pulling to avoid disturbing roots of nearby plants. The thinnings can be eaten as greens. Harvest begins about 45–65 days from seed sowing. Begin harvesting when the roots are at least 1 inch wide, harvesting alternate plants to allow remaining plants to grow up to 3 inches wide. Beets may get tough if left to grow larger. Small leaves may be harvested for salads and older leaves can be cooked as greens. More links: The information above was adapted for Santa Clara County from UC Master Gardener Program of Sacramento County's Growing Beets in Sacramento. See article for additional growing details. Bull's Blood, OP Deep reddish-purple leaves are popular as baby greens in salads. Roots display pretty pink rings when sliced crossways. 8–12" tall. Plant 4–6" apart. Chioggia, OP Old Italian heirloom beet known for its red & white candy–striped rings and mild, sweet flavor. Named after a fishing town in Italy and pronounced ‘kee–OH–jaw’. 8–12" tall. Plant 4–6" apart. Detroit Dark Red, OP Popular heirloom beet, uniform and smooth, with sweet red flesh and tasty 14" tops for greens. 10–14" tall. Plant 4–6" apart. Formanova, OP Tasty, fine-textured beet in a convenient long shape that is easy to peel and slice into rounds. Delicious leaves too. 8–12" tall. Plant 4–6" apart. Golden, OP Sweet golden beets are mild and tasty. Beautiful in salads. Greens are delicious and mild. 8–12" tall. Plant 4–6" apart.